Change is never easy. Especially in a context of business, as it affects a lot of aspects. In order to ensure a smooth transition from the current state to the desired state of business, you need the correct change management tools and resources at hand. We’ve compiled a list of useful change management tools that you can use to adapt to new changes in your organization seamlessly. In the simplest of terms, change management is a systematic approach towards dealing with change. It’s a structured way of applying tools, knowledge, and resources to effectively drive organizational success. There are multiple stages in a change management process. 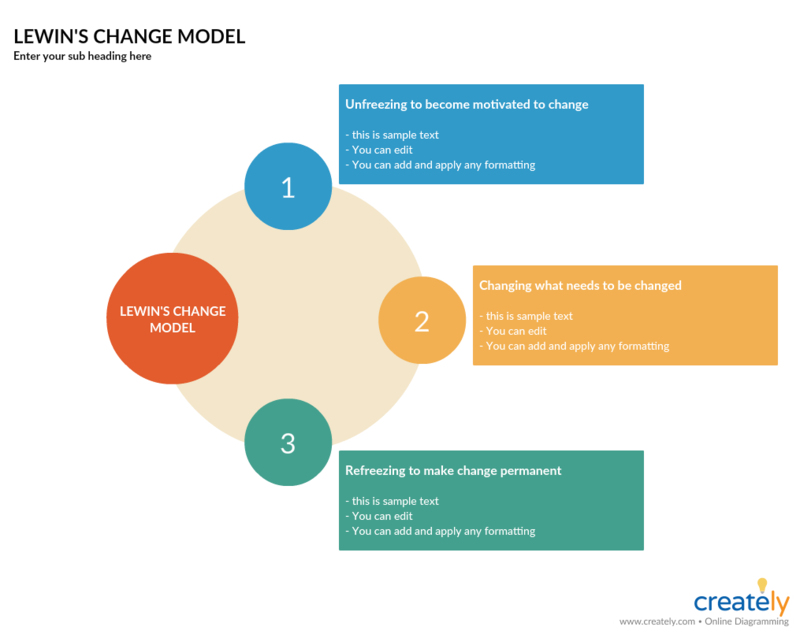 The following change management process template highlights these different change management steps. Flowcharts and process maps are great ways to visualize the various processes in the organization for the benefit of everyone, including those who are not directly involved in carrying them out. 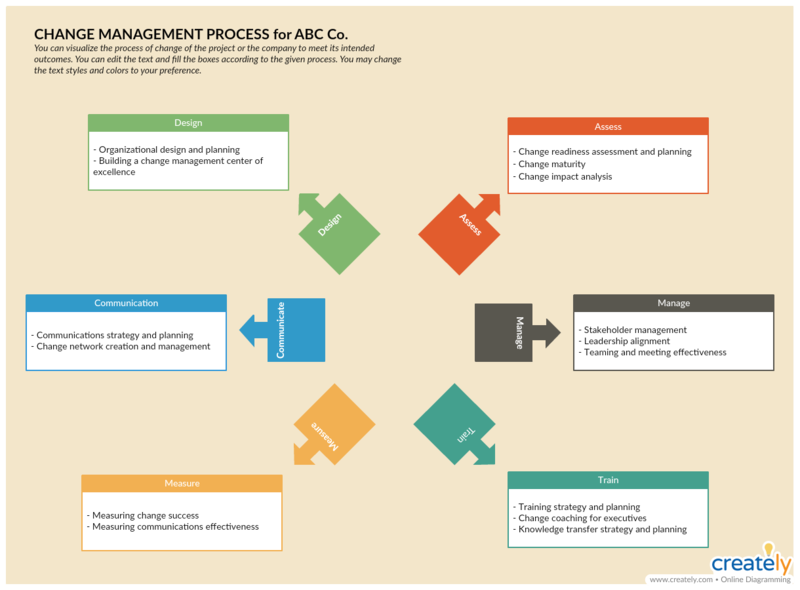 In the readiness assessment or the preparation stage of the change management cycle, flowcharts can help you map out the current state of organizational processes. Any change that will be discussed and implemented can be added to the flowchart, in which way it can be preserved for future reference. In our handy tutorials, we discuss how to draw flowcharts and process maps in detail including everything else you need to know about the two diagram types. Do check them out below for further reference. With the Creately Viewer, you can link your current-state flowchart/ process map and the future-state flowchart/ process map, so anyone who refers to it can quickly see the changes between the two. 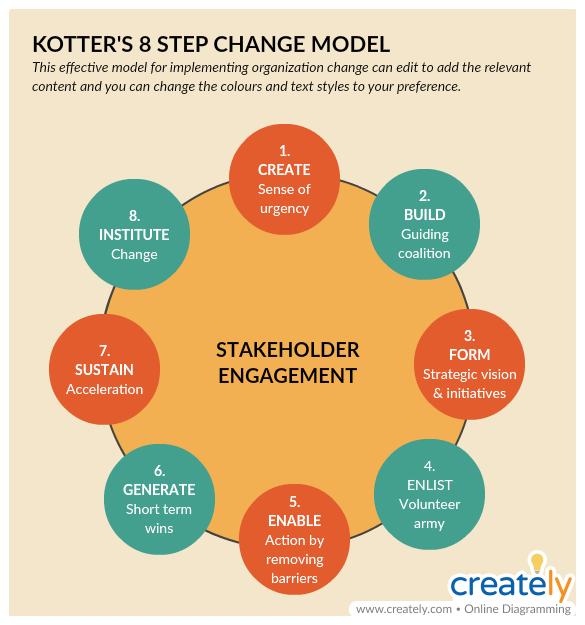 The ADKAR model presents a set of goals that team leaders should try to achieve, and being able to do so is the key to earning the support of the employees to successfully implement the change strategy. Clearly communicate to the employees what change is occurring and why. Build desire in your employees to support the change so they would do their part naturally rather than forcing them to do so. Make sure to help employees learn how to support the change through training programs, job aids, tutorials, coaching programs and checklists provided by the company. Help employees further improve their ability through feedback and evaluations. Make sure that employees don’t go back to their old ways. In order to reinforce the changes, give incentives and rewards to employees. 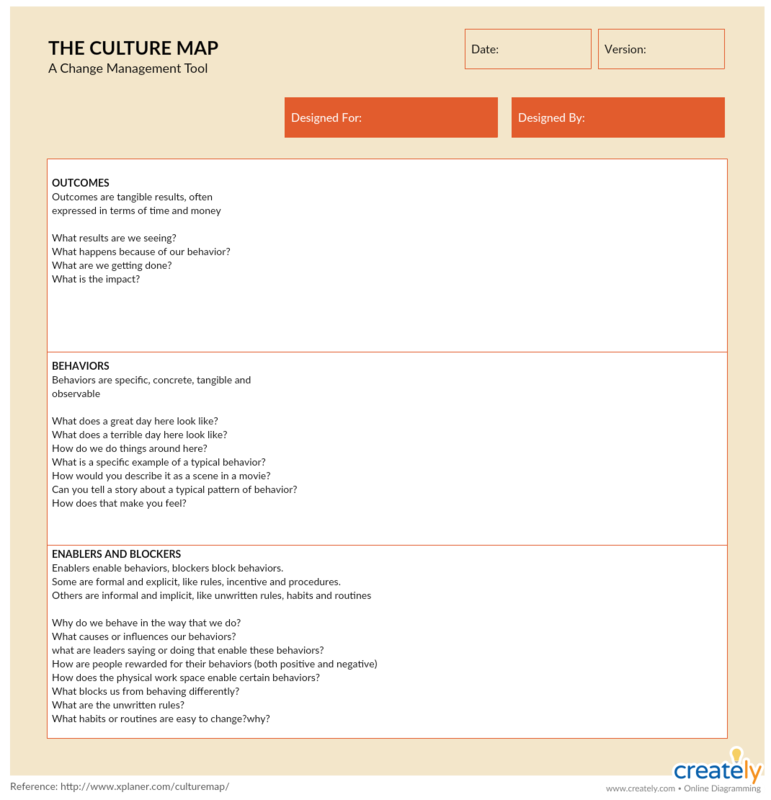 A culture map is a tool that is used to visualize the company culture, which is influenced by values, norms, employee behavior etc. It helps you discover information that is crucial to your change initiative, such as who are the positive enablers and how you can minimize risks during a project. Identify the groups that belong to the different subcultures in your organization. These could be IT, finance, marketing, sales, etc teams in your organization. Identify 5-6 people that can best represent these subcultures. Interview each group to know the cultural blockers and enablers reinforced intentionally or unintentionally by the management. Organize the information such as the behaviors, enablers, blockers, current and desired outcomes etc. in a cultural map like the one below for quick analysis. 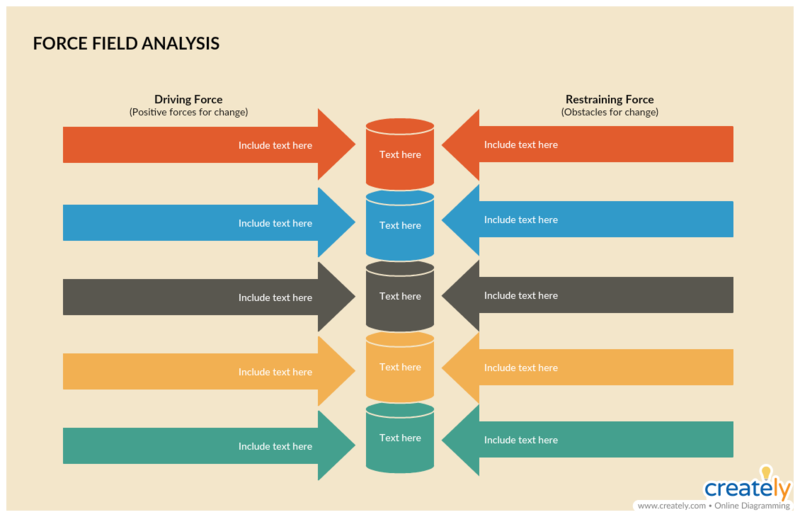 Force field analysis, also known as a barrier and aids analysis, is a useful decision-making tool. It helps you identify and analyze forces for and against change or the implementation of a proposed solution. What is your goal for the change? What are the forces you can think of that would help you move forward with your plans? Remember to look at factors in both the internal and external environment. What are the forces that are blocking you from implementing the changes? Fill out these sections for the analysis using the template below. In the stakeholder analysis, you identify stakeholders and categorize them based on different factors such as geography, income groups, occupation, legal requirements etc. At the end of the analysis, you’ll have found out who your project’s stakeholders are and why the project is important to them. Think of all the people who might be affected by your project. Remember to consider those who come from outside of your company as well. Your list of stakeholders may include people who may be affected by and care about your project and, who may be unaffected by and be not that interested in your project. 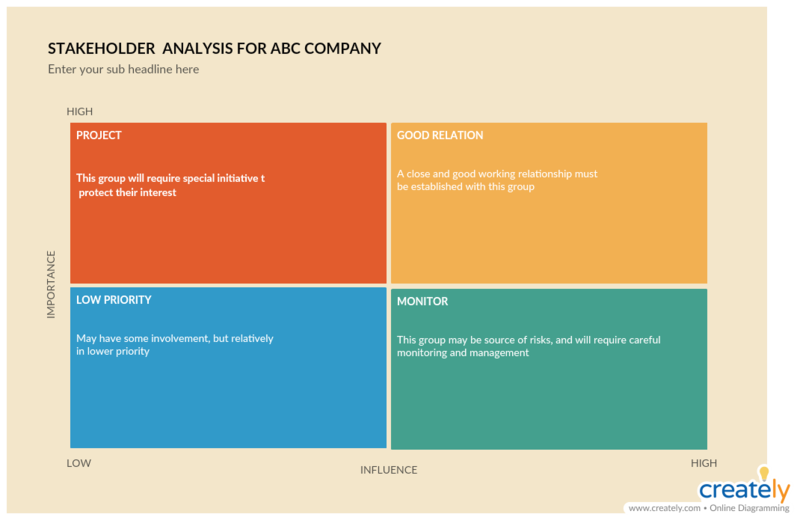 Using a Power/interest grid for stakeholder analysis like the one below, you can prioritize your stakeholders based on their stake in the project and their engagement. 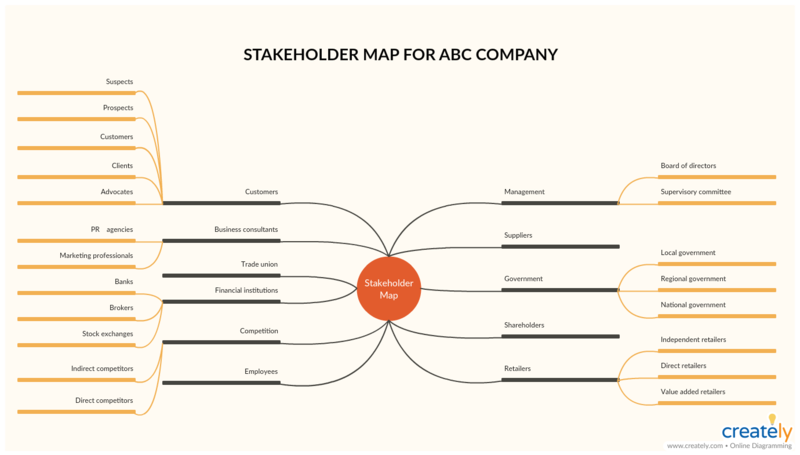 Now that you have prioritized your stakeholders, you can use a stakeholder map to easily categorize them. If everyone really wants the change to happen, it is much easier to implement it. Creating a sense of urgency among everyone will help spark that motivation in them to embrace the change that you are about to bring about. You can use a SWOT analysis to emphasize the threats and opportunities that lurk in the marketplace or the industry. 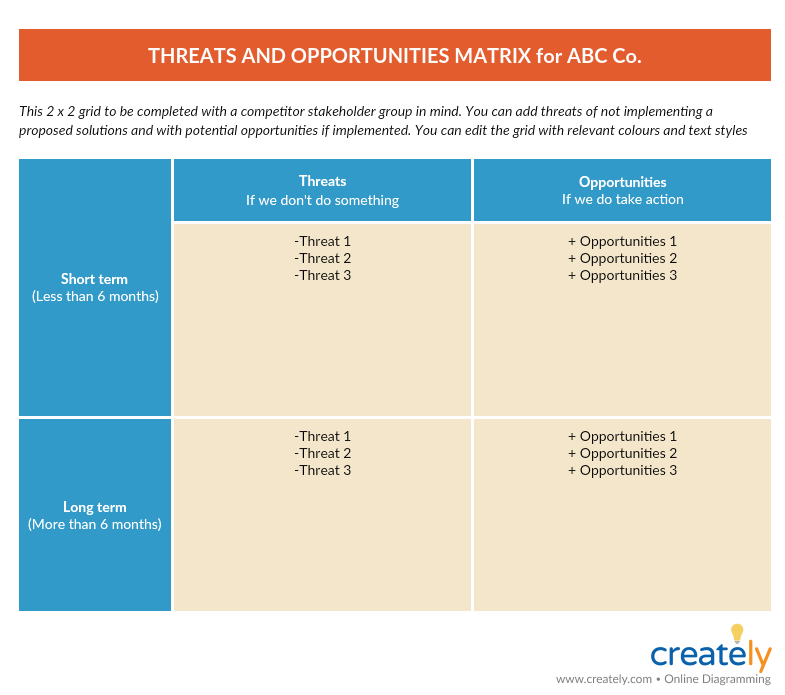 Additionally, you can also use a threat vs. opportunity matrix to show how your company stakeholders will be affected by the change or lack thereof. Build a strong team made up of influential people from all statuses and expertise and who can convince others that change is necessary. Create a clear vision as to why change is necessary or as to why you are asking your employees to do something. Determine the values that are linked to the change and create a strategy to get to your vision. Communicate your vision frequently so that it will be embedded within everything your team does. Not only during special meetings but every chance you get, try to remind the vision to your team. Identify barriers that are blocking the implementation of change. Help those who are resisting change see what’s needed. Reward people to support change. If your staff can see short-term wins that will motivate them. Create short-term targets so you can celebrate quick wins. If something worked, identify what went right and improve it. Set goals and continue to work on it, building momentum. Make sure that any change you gain, you make it part of your culture. This is the stage of preparation. Before any change can be implemented, you need to spread awareness as to why it is necessary. Everything from processes to organizational structures should be examined and shown to the employees at this stage. The more they are aware, the more they’ll be urged to welcome the change. This is the stage where real change occurs. Employees will learn new behaviors, processes, and ways of thinking during this time. It’s time to solidify the new behavior, processes, goals etc. You must make sure that the change implemented is not lost and is incorporated into the culture of your organization. Any change management project includes a large number of tasks, and to complete them successfully you must make sure that they are completed on schedule. Gantt charts are a useful tool to visualize and track the tasks scheduled over a period of time. We’ve covered how to use Gantt charts to plan a project in a few easy steps in this guide. Do check it out for further reference. What Are Your Favorite Change Management Tools? In this list, we’ve covered a list of tools that you can use during each stage of the change management process. 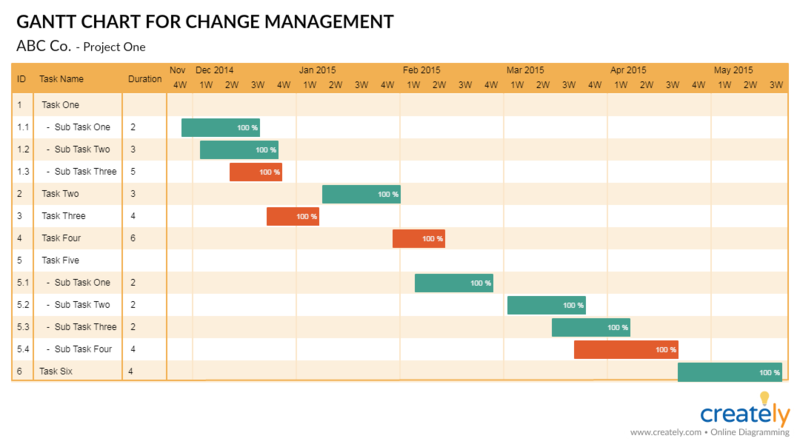 What other change management tools do you use for your project initiatives? Let us know in the comment section below. And don’t forget to check out our Ultimate list of marketing strategy tools that will help you narrow in on the most important decisions in a coherent manner so that your resulting marketing plan is effective. 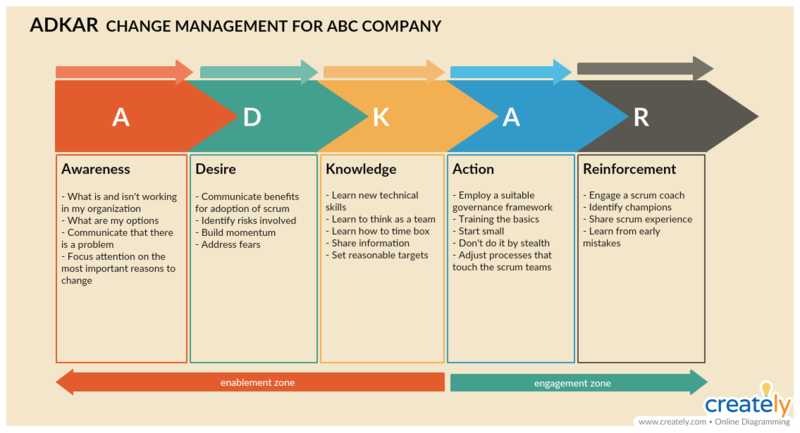 I have just downloaded your Change Management Process for ABC company. Are you aware it contains spelling mistakes? Traming AND Trasfer on the last line of the same box is missing the n from the word. Also the word Strategy is spelt in correctly in Communications and Training Boxes somebody has added an ‘r’ into the word. I am not going to check it all for you, but honestly this looks very pool and you might want to correct this quickly.